The majority of pupils have returned to a school campus shut on safety grounds after a boy was hurt when a smart board fell on him. It was one of a series of incidents which led to closure of the North West Community Campus in Dumfries last September. More than 400 nursery and primary children - from an overall roll of about 700 - are going back this week. Pupils from Langlands special school have already returned. Secondary students are expected to go back after exams in June. Primary parents welcomed the return of their children to the site after about seven months in other schools in the town. Lyndsay McWilliam said: "I have been in and had a look so it is all above board - it looks good. "It is more safe now, we are looking forward to it." "It has been a long time coming but it is a lot better now," added Robbie Dempster. "We have been round and had a look and there are a lot of fixtures and fittings that have been changed - so it definitely looks a lot better." The multi-million pound campus opened in August last year but shut the following month due to safety concerns. Staff and pupils were injured in incidents that included a board falling on four-year-old Jack Hall and a sliding door coming off its rails. Fifteen children returned last month with nearly 450 going back this week. Secondary pupils, who are due back on site in June, are currently studying at Maxwelltown High School - one of the sites the campus was designed to replace. It had to be pressed back into use due to the prolonged closure of the new facility. 21 August 2018 - The campus to replace Lochside and St Ninian's primary schools, Langlands special school and Maxwelltown High School opens to pupils. 24 August 2018 - The school is shut just days later after a child was hit by a door. 28 August 2018 - The facility reopens after safety checks. 7 September 2018 - The campus is closed indefinitely after a pupil is struck by a smart board. 11 December 2018 - It emerges that the site will be shut until the spring as work will not be finished on schedule. 31 January 2019 - A timetable is set for the return of pupils. Dumfries and Galloway Council has previously said it wanted to make sure everything had been done "absolutely perfectly" on site before children were allowed back at the £28m facility. It said it would not rush work and make sure everything was "done properly". A detailed report into what went wrong at the site is expected in the near future. Final interviews were due to be completed in March with the Scottish Futures Trust expect to report back shortly after that. This is a big day for education in Dumfries and there will be a lot of fingers crossed. 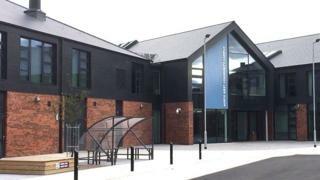 The North West Community Campus was meant to be a flagship facility but it was dogged by problems before and after pupils first set foot on site. Repair work has taken longer than initially expected but that was because the council wanted absolute assurances there would be no repeat of previous issues. All eyes will be on Lochside in the days to come to ensure that, this time around, everything goes smoothly.